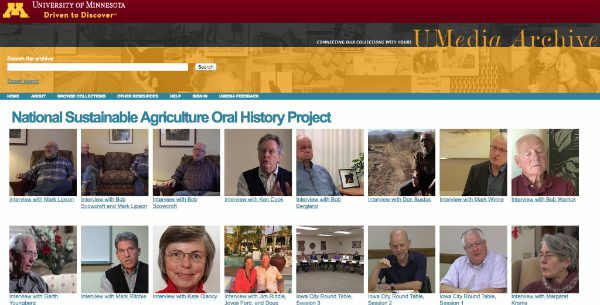 The National Sustainable Agriculture Oral History Archive is a collection of interviews with people who have been instrumental in the development and implementation of public policies to advance sustainable agriculture in the United States. It was started in 2015 and has been growing ever since. Several of the interviews are with key members of the National Sustainable Agriculture Coalition (NSAC) and their interviews document the process of formation and evolution that has led to the NSAC that we know today. They also discuss the federal policy reforms NSAC, its allies, and predecessor coalitions have achieved over the past four decades. To date there are 31 interviews available in the archive, most in a video format with accompanying written transcription. The plan for the next year involves conducting 8-10 more interviews featuring several farmer/civil rights activists in the South among others. What now? Exploration of priorities going forward that are needed to strengthen organic and sustainable farming and build a healthy food system. The archive is housed at the University of Minnesota’s Institute for Sustainable Agriculture. The interviews were conducted by Ron Kroese (rkroese@visi.com), a senior fellow with the University’s Endowed Chair in Agricultural Systems.